I’m a wide-open spaces kind of girl. I love living ten minutes from the heart of our big city and I love all that it has to offer, but sometimes I need the restorative peace that I feel in a quiet, outdoor place where few other people tread. Our time in the Holy Land was no different. After our 31-hour travel ordeal and two days running around Jerusalem at breakneck speed trying to see everything, we were tired and needing a breath of fresh air. What to do? 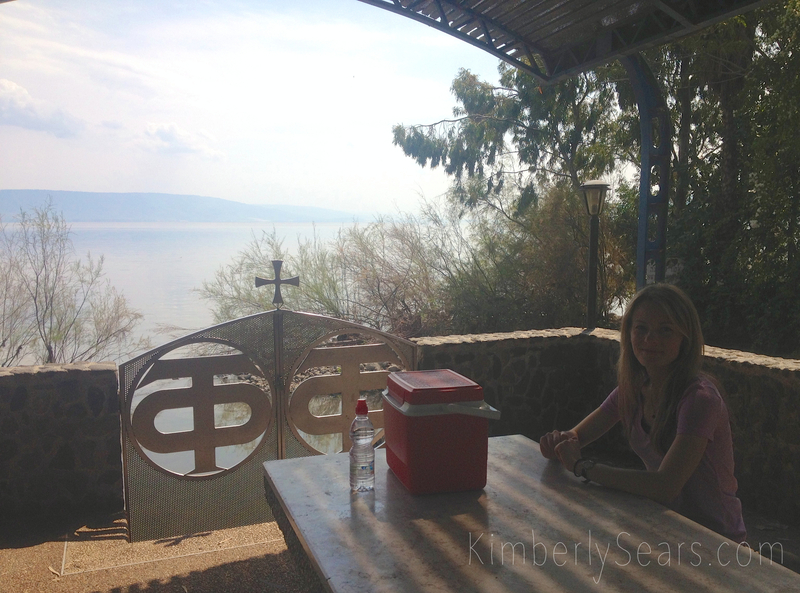 Why, run away to Galilee, of course! 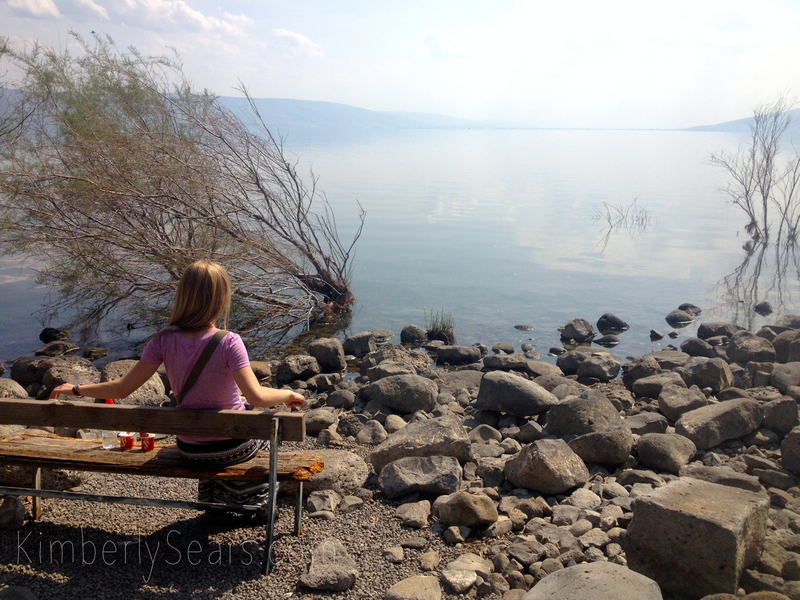 We revisited all my favorite spots and hit the Galilee highlights: Capernaum and the white synangogue, Tabgha, the Mount of Beatitudes, Tiberias. And best of all, we discovered a new place that we love, recommended to us by our dear friends who gave us lodging on our trip. Now that I’ve experienced how enchanting this place is, I can’t believe that 1) this place only has a stub of a wikipedia page, 2) most visitors to Galilee never even go there, and 3) I lived four months in the Holy Land without ever finding out about this gem. So the word’s not out yet, but shhh! I’m about to tell you, if you can keep a secret. 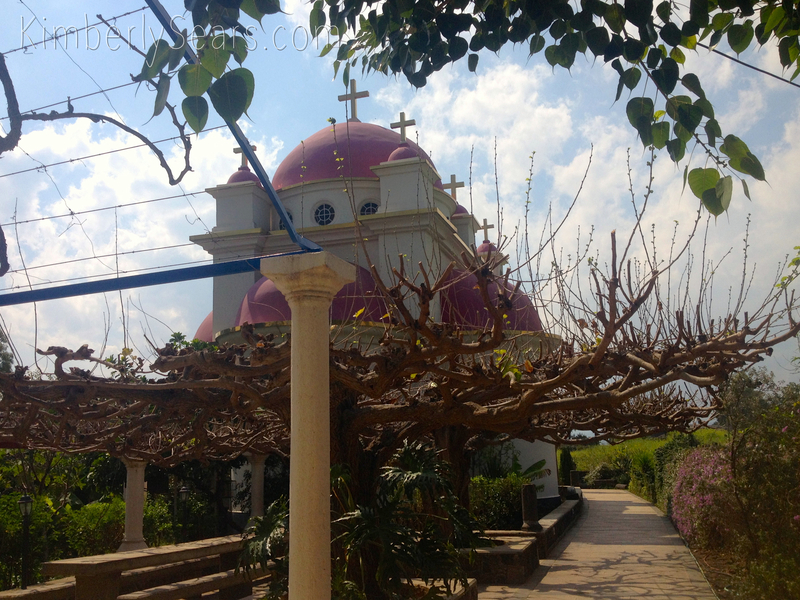 It’s the Greek Orthodox Church of the Twelve Apostles in Kfar Nahum, or Capernaum, on the shore of the Sea of Galilee. The grounds were unrivaled in terms of how well-kempt and beautiful they were. 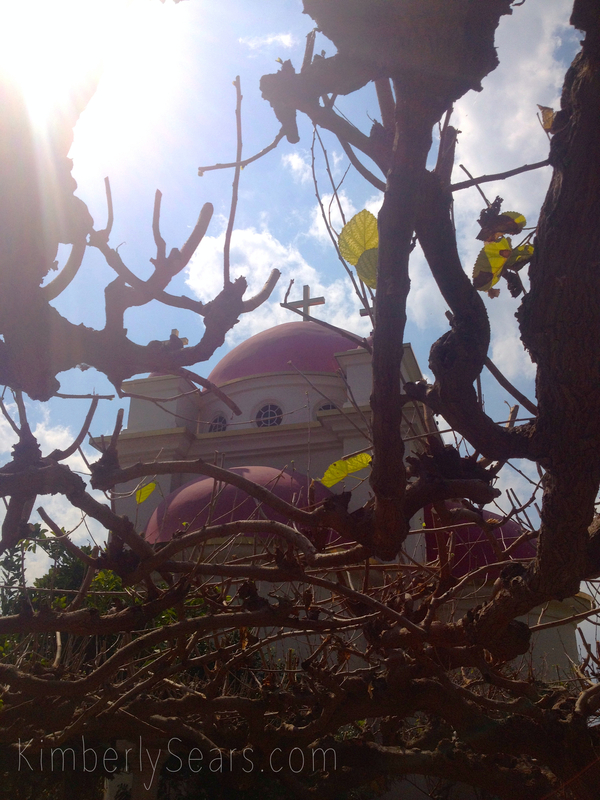 Orchards of citrus trees, rows of stately cypress trees, and walks covered in grape arbors surrounded the church. The hedges and the stone walls around the grounds hung thick with honeysuckle and fuchsia bougainvillea flowers. From the moment we crossed the threshold of the gate, we were bewitched. We were greeted by the most sumptuous citrus aroma I have ever smelled. 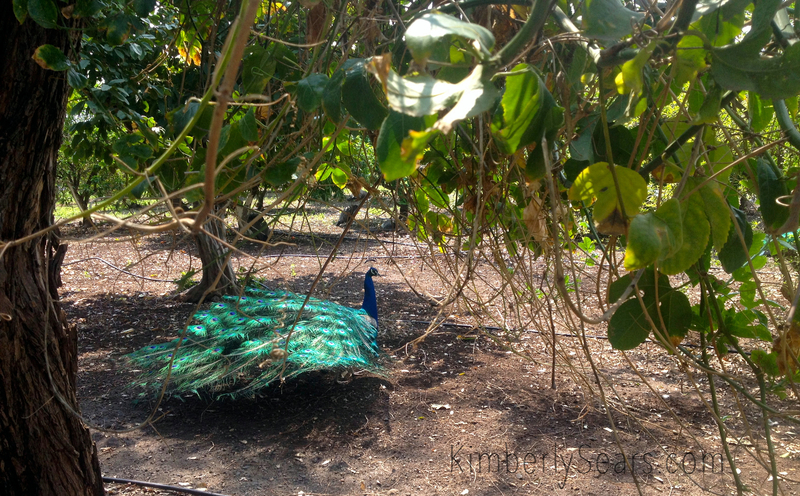 And by several strutting peacocks. I didn’t think it possible that the inside of the church could surpass the outside in loveliness, but it did. When we crossed the threshold of the church I audibly gasped because what I saw was so beautiful—resplendent ornamentation and chandeliers, and the most stunning iconography I have ever seen. I’m so sorry that this shot is a little blurry! 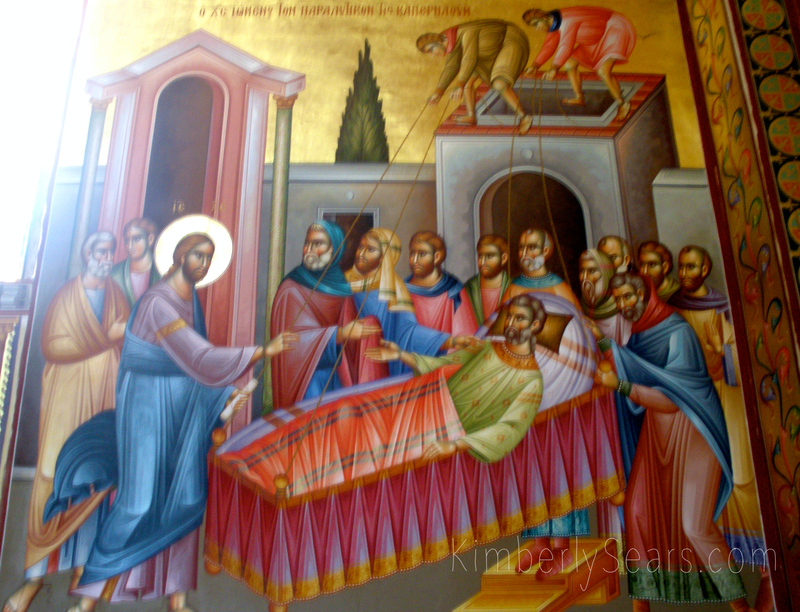 But don’t you love this icon of the paralytic man being lowered into the house where Jesus will heal him? I do. 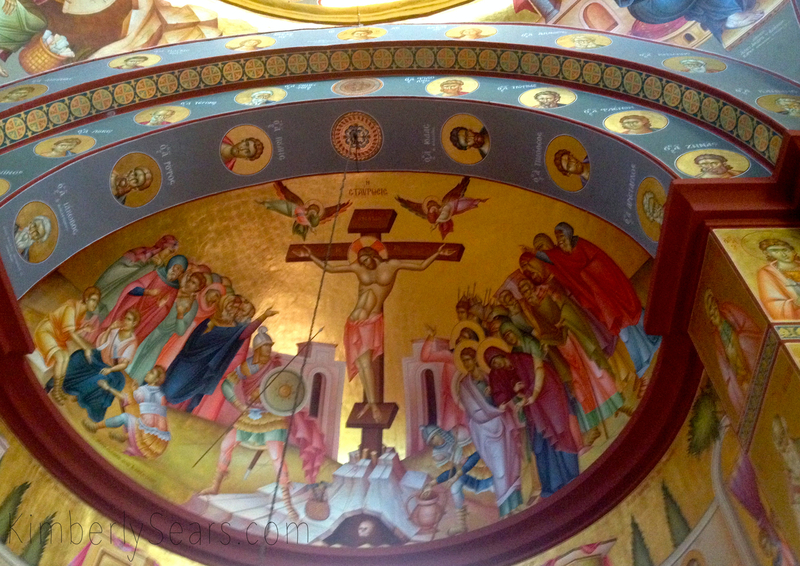 The faithful being gathered into Abraham’s bosom; note the name Abraham displayed in Greek. 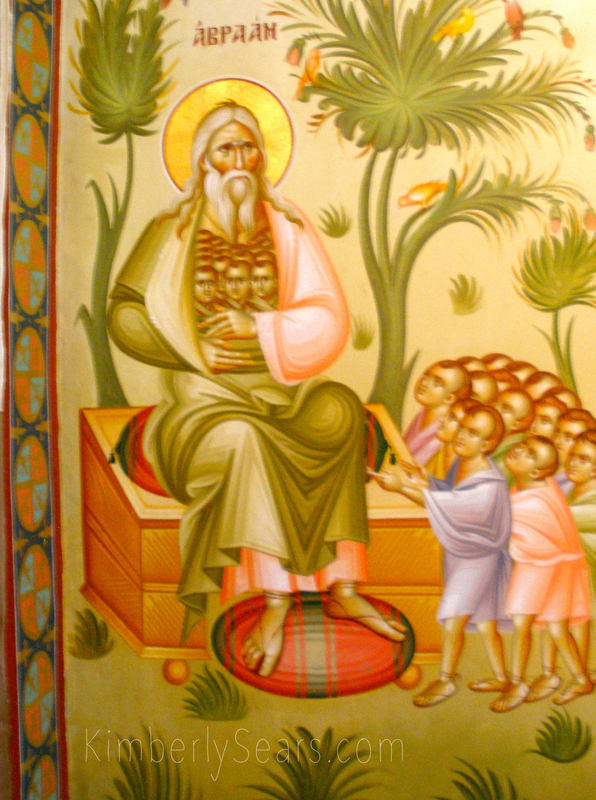 Remember after the Lord’s crucifixion and resurrection when he gave Peter the injunction to feed his sheep? According to tradition, that occurred on the northwestern shore of the sea, not far from here, so this icon commemorates that event. 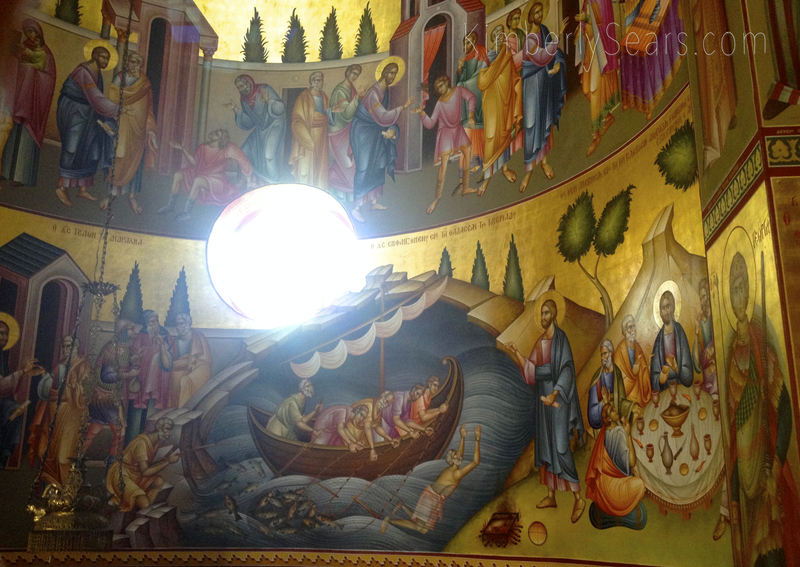 Do you see the disciples pulling their catch into the boat? And see how Peter has jumped overboard and is swimming to the shore, where the Lord is waiting with the fire on which he will cook their breakfast? 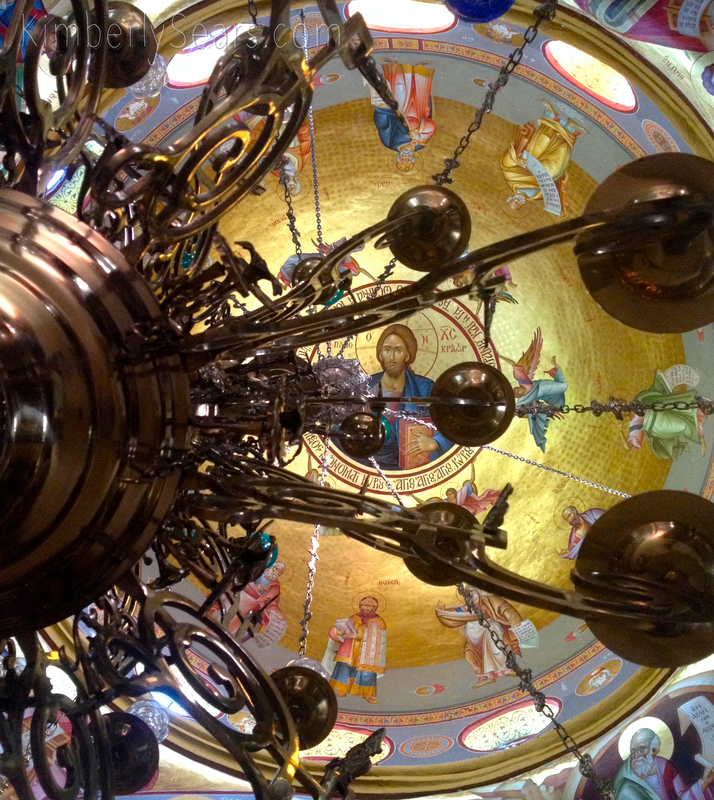 All around the church’s domed ceiling appeared icons of the twelve apostles and portraits of the faces of the seventy apostles, as they are called in Eastern Orthodox tradition. 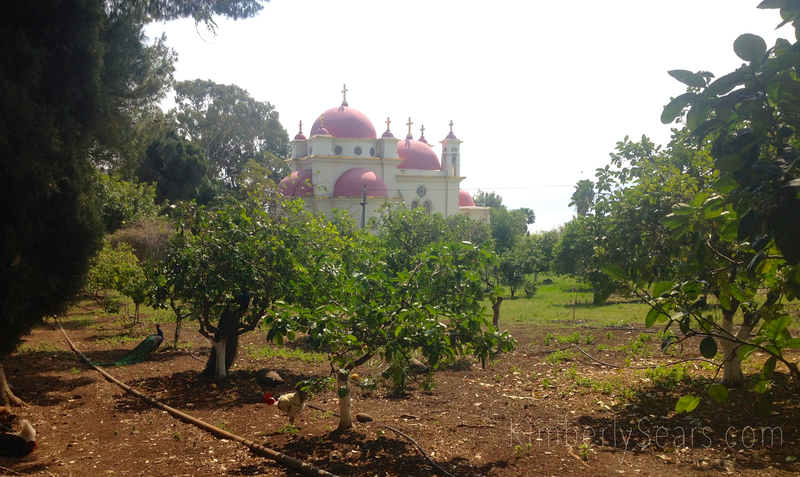 “On the shore of the Sea of Galilee there is a Greek Orthodox monastery with a beautiful church in honor of the 12 Apostles…It is here that our Lord Jesus Christ chose and called forth His Apostles, here He preached and performed miracles, such as the healing of the paralytic, the mother-in-law of the apostle Peter, the servant of the centurion and many others. Here in the times of Christ was the city of Capernaum. “In the IV century AD many monasteries and churches were built in the places where our Lord lived, taught, and performed miracles. 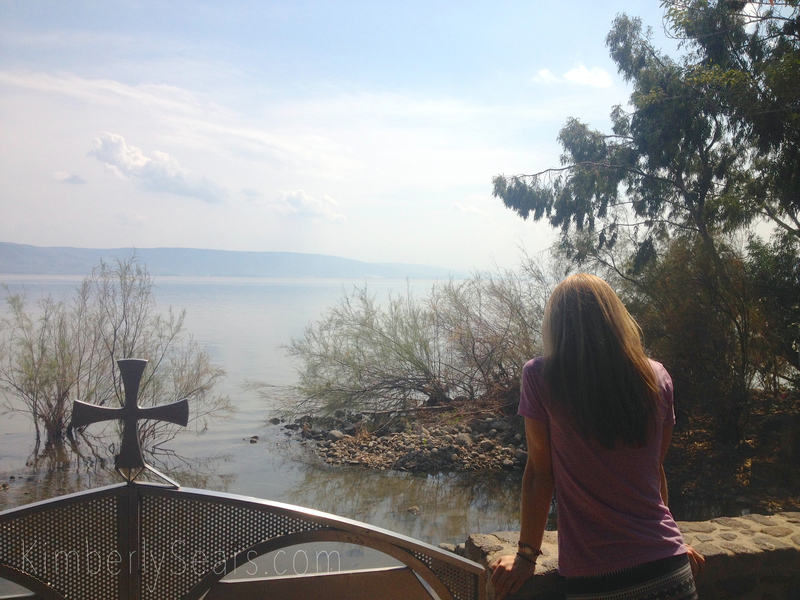 By the V century the Christian community of Capernaum had grown very big. However, in the first half of the VIII century the flourishing city of Capernaum was completely destroyed by an earthquake. After partaking of the iconography within the church, we spent some time picnicking on the grounds, and walking along the shore. We picnicked in this lovely spot on the church grounds. See that gate? Behind it are steps that lead down into the water! I delighted in the beauty of this site, and reveled in the profound peace and stillness I felt there. The Church of the Twelve Apostles is unlike anywhere else in the Holy Land, and for me it will always be a sacred place.